A Valterra 10' Extension Hose For The Sewer Solution System. 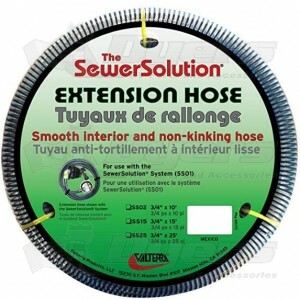 *Extension Hose Only* For use with the Sewer Solutions System. Bought 2 extension hoses, they linked up easily, no leaks. The price ($30) for a bit of hose seemed high - but they recommended PVC ,as a cheaper alternative, on their site. That being said, Dyers had the best price on sewer solution & accessories by far. Every thing arrived ( well packaged ) quickly. Like the sewer solution very much. So much better and cleaner to work with than flex type sewer drains. Like all my purchases from Dyers, I find their prices to always be lower than competitors. The product is okay. The price is a bit of a ouch. This product is perfect for what it needs to be used for. I prefer if the price could match other similar tubing since this IMO is nothing special. I will probably not buy another one just cause I find cheaper for off brand pvc flex tubing. Quality is awesome! High price for 3/4" hose.